The Sunday Salon [8.14.11] – my books. my life. I have a husband again! And, for the first time in months, we are both home to enjoy a lazy weekend. I have hopes that a return to normalcy will give me back some of my focus and I will start reading again. I only finished one book in the past 10 days and I have barely listened to any audio. 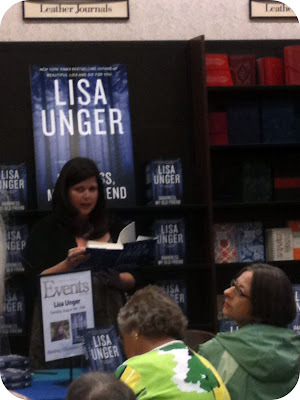 On Tuesday, I met Erin from In Real Life at the Clearwater Barnes and Noble to celebrate Lisa Unger’s launch of Darkness, My Old Friend. I have not read any of her books yet, but I was excited to finally meet Erin (are we the only two Tampa Bay book bloggers?) and I always love finding new authors. I picked up a copy of the book and I hope to get to it soon. Yesterday, I gave in and joined Audible. I get most of my audiobooks from my library, but occasionally there are titles I want that they don’t carry, so I thought this was the perfect way to supplement my audiobooks. I downloaded Deadline by Mira Grant (#2 in the Newsflesh Trilogy) as my first purchase. Do you belong to Audible? Do you like it? And the one book I did finish? Vaclav and Lena by Haley Tanner. I LOVED it. One of my favorites for the year so far. Look for a review soon (or someday). 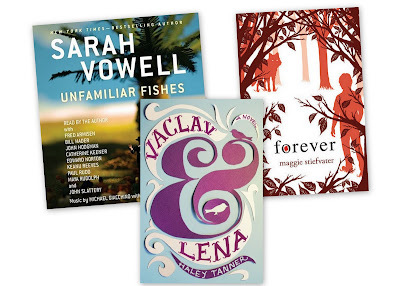 I am currently reading Forever by Maggie Stiefvater and listening to Unfamiliar Fishes by Sarah Vowell. Oh, and my bookish present from Oxford? 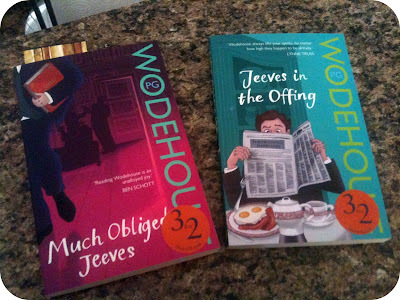 Two new PG Wodehouse books from Arrow Press. So pretty. How’s the Sunday going for you all? Unfamiliar Fishes has been sitting around my house at one time or another all summer, but I’ve never gotten around to reading a single page. I must request it yet one more time from the library. Here’s this week’s post: Sunday Salon: Wanna Be 25% Happier? And don’t forget to sign up for the Readerbuzz August Giveaway! Welcome back hubby! Things will be better now. I have not signed up for Audible, simply because my library has probably 80% of what I want, and can’t even get all of that listened to. If I ever move away from this most wonderful library though, I probably will have to. I love those Jeeves covers! I pretty much use audible exclusively. I haven’t tried my library because I owe them money *blushes*. I’m really pleased with it so far. I hate CDs, so if I couldn’t download audios, I don’t know what I would do! The selection is sometimes just a bit limited, however. Especially with the smaller presses. I use audible a lot for audio, and haven’t ever gotten into getting things at the library because I just don’t listen to audio a lot of the time. I know audible does have a great selection though, and that there are some really neat titles available there. Good luck with it. I know you will find a lot to like! I am always thinking about joining Audible, but I haven’t made the leap yet. I’ll look forward to hearing about how you like it. I’m also glad to hear that Vaclav and Lena was good. That book has been on my radar for a few months now. Ooh I have Vaclav and Lena. Can’t wait to see what you think! Auburn football characters some of a few shot, three slaughtered by person 1 . Rubber Connects Grommets Some sort of search for seemed to be ongoing The weekend towards the dude shop dead golf shot some youngmen, doing away with a variety of and also permitting some sort of suit hugging someone’s, at just anoff-campus occasion near Auburn University or throughout Chickasaw latter Tuesday.